Maybe it’s the ludicrous weather or the knock-on effects of that Brandon Cronenberg movie, but I’m six days into the festival and it seems I’ve already run out of steam. For the first time since my arrival, I actually went a full 24 hours without seeing a movie after yesterday’s Haneke screening, and today I’ve seen only one film. Room 237 is the first documentary feature from Rodney Ascher (whose recent work also includes this inexplicable Andrew WK/Soulja Boy/Matt & Kim collaboration). It premiered earlier this year at Sundance and now appears in Cannes’s Directors’ Fortnight strand — a sort of dumping ground for films too weird and/or bad for Un Certain Regard. Luckily, it’s the former in this case. 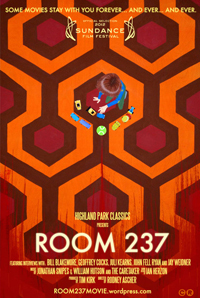 Narrated by five of The Shining‘s most obsessive devotees, Room 237 presents their oddball theories (one thinks the film’s a metaphor for the Holocaust, another that it’s Kubrick’s admission that he helped fake the moon landing) alongside original footage from the film, beautifully assembled to present their outlandish ideas in the most persuasive light. At 102 minutes, it drastically outstays its welcome, but there’s something quite charming about Ascher’s refusal to outright dismiss his subjects’ hallucinations. So, what have I been doing with all this spare time now that I’ve reduced my average daily film consumption down to under two hours? 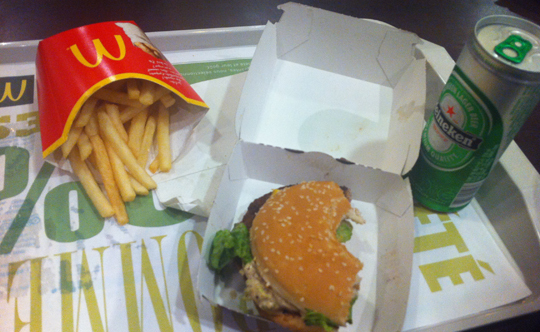 Well, as you can see I’ve now had my obligatory festival McDonalds (complete with a tiny can of Heineken), which I’m pleased to report was delicious. I’ve also organised my change, broken an umbrella and lost a bow tie. 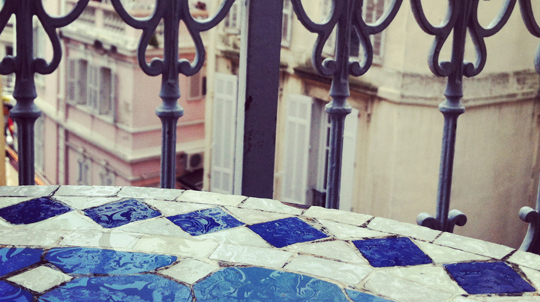 Live fast, die young.